Are you looking for new ways to advertise on team websites? Are you looking fpr new ways to leverage QSR partners? McDonald's of Northeast Ohio is currently doing a tremendous job leveraging partnerships with the Cleveland Indians and the Cleveland Cavaliers to drive business at retail. The leading QSR chain is offering a collection of promotions designed to reward sports fans in the local marketplace and drive traffic to retail. 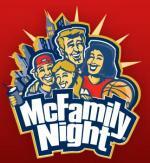 McDonald's featured a Cavs McFamily Night during the 2008-09 season that offered Cavs fans the chance to purchase four (4) tickets and four (4) McDonald's meals for just $72. The tickets, located in the Loudville section at Quicken Loans Arena, are valued at $116 ($29 apiece). The offer was made available to fans for 15 games during the season.